Available in 0-6 Months & 6-12 Months. Baby boys navy & white sailor style knot collar dupion christening romper & hat, the perfect outfit for your baby boys christening day. Romper: Pure white dupion (silk effect) long sleeved romper with a navy square collar and stripes and a knot bow. A discreet zip fastening is on the back for easy removal / changing. Contrasting navy trim to the cuffs and ankles. Hat: Matching navy and white dupion beret hat. 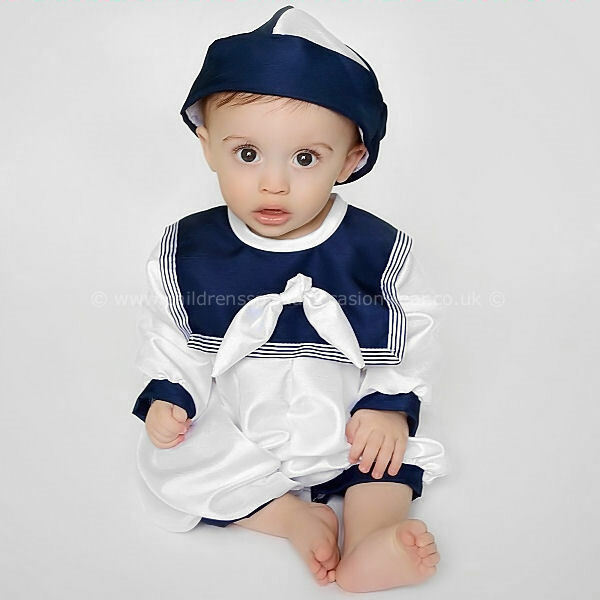 This designer christening romper outfit is UK made and designed by the exclusive christening designers Eva Rose. The quality is outstanding and will make a precious family heirloom for future generations of your family. This romper outfit is brand new complete with tags, hanger and a clear cover bag to keep the outfit in tip-top condition. Really lovely outfit on my son, so many compliments at his christening. Everybody thought we had paid a fortune for it as the quality is amazing. Really pleased with the price and service on this website. So many beautiful products to choose from.